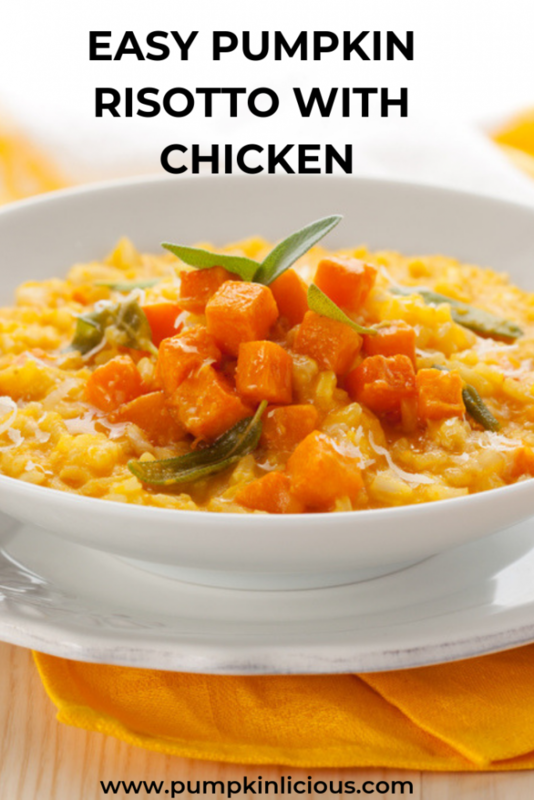 This chicken pumpkin risotto recipe is delicious and creamy but actually contains no cream and is fabulously healthy. It’s perfect for an amazing and delicious dinner! Wondering what to do with leftover pumpkin? Have you made a pie and have some cooked pumpkin left? Don’t worry if you haven’t, as you can even use raw pumpkin in this dish and it will work out just as good. Here’s what I did the other day. I had boiled up some pumpkin to make pumpkin pie bars and chocolate pumpkin cake. (Both of which were totally yum, by the way). When I’d finished, I wondered what to do with a bowl of cooked pumpkin I had left, and it was getting to be about lunchtime. The idea for chicken pumpkin risotto popped into my head and I thought “How hard can that be”? Well, not hard at all actually. I had in the kitchen half a leftover roast chicken, some spring onions, a couple of large flat mushrooms, some brown rice and some cheddar cheese. And the bowl of cooked pumpkin of course. You can use white rice if you like, but I love the texture and flavor of brown rice and it’s much higher in fiber and good for you. I covered the leftover chicken carcass with boiling water from the kettle, bunged in a couple of chopped garlic cloves, a few bits of leftover veggies I had in the fridge (a bit of leek, carrot, and cabbage) and brought it to the boil. (If you want to make a vegetarian version, you can do this without the chicken, substitute a homemade, or shop-bought vegetable stock. You can add some tofu chunks, or cashews at the end instead of the chicken if you want to increase the protein content). Meanwhile, I put some extra virgin olive oil in a large flat frying pan, chopped the mushrooms and spring onions and fried them gently with some more chopped garlic. When they had started to soften, I added about 8 handfuls of brown rice and stirred it around so it could pick up the flavor. This makes about 4 servings and just fits into a large frying pan. During my prep time, the chicken was boiling nicely and creating some lovely stock. I ladled some of the stock over the rice and left it to cook for a while. I repeated this process, adding more ladles of stock each time the rice had absorbed most of it. With brown rice, this takes ages. It took almost an hour for the rice to cook. I know that brown rice takes longer to cook in stock than in plain water, so you could pre-cook the rice in a pan of boiling water (about 30 minutes) or in a rice cooker. But when I tell you how delicious this turned out and I think it might well be because it had so long to absorb all the flavors of the stock, you will think it’s worth it like me. If you’re short of time, you can use white rice – use a good short grain risotto rice like Valencia. Then it should only take about 20 minutes for the rice to be ready. I picked out some of the chicken breasts from the stock and shredded it into the risotto. I added the pumpkin (about 2 small cups of cooked, roughly mashed pumpkin meat) right towards the end of the cooking, as it really only needed to heat through. It was already partially mashed, so it broke down quickly and gave a beautiful creamy texture and a rich warm orange color to the risotto. If you haven’t pre-cooked your pumpkin, cut it into small chunks, about 1-inch square, or even grate it, and add it 30 minutes after the rice if you use brown or 10 minutes after the rice if you use white rice. Find out how to cook pumpkin to perfect your dish. As a final touch, I added about a cup of grated cheddar cheese and let it melt before stirring it through. I’m sure it would be superb with Parmesan too, which would be more authentic Italian, but I didn’t have any! The flavor and texture of this was just wonderful. The brown rice gives it an extra nutty bite as well as being high in fibre and I love it. The vintage cheddar cheese gave a depth and bite that was subtle and satisfying. It was absolutely worth the wait. I am definitely going to make this pumpkin risotto every time I boil up a chicken carcass now. The added bonus was that I also had a big pan of chicken stock with chicken and vegetables still in it, which I made into soup. I managed to put one portion of this wonderful pumpkin risotto in the freezer, and it froze well, but it didn’t stay there long. Just too tempting. I re-heated it straight in the microwave for about 4 minutes and it was good as new. One neat idea which I am massively fond is dinner in a pumpkin! 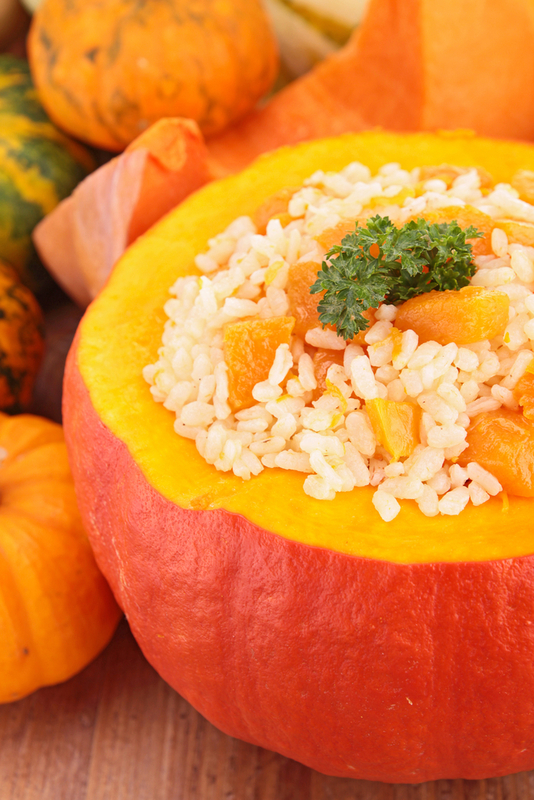 You could easily serve the pumpkin risotto in a pumpkin. Imagine how impressed your dinner guests would be! Can you make this pumpkin risotto without chicken? 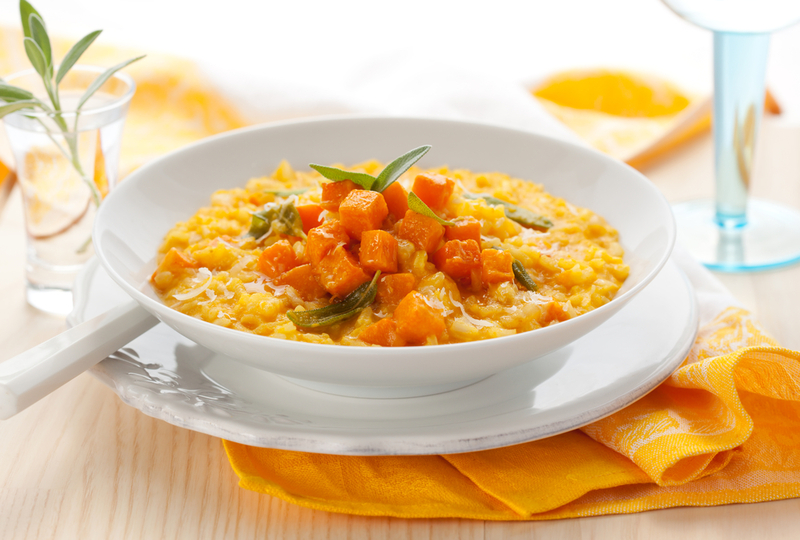 Some of my friends love the idea of a tasty pumpkin risotto but they are vegetarians and worry that it will not be as flavorsome! A good alternative to bulking up the calorie content, and taste is the addition of blue cheese, or any sort of cheese really. I absolutely love feta, and it tastes divine with my pumpkin salad with feta cheese so I am sure it be scrumptious here also. I have heard the addition of brussel sprouts is also welcome and adds to the taste of a vegan pumpkin risotto. The addition of white wine also works a treat with this dish. I adore a good risotto and my list of easy pumpkin risotto recipes is sure to be right up your street. Would you add any veggies to this chicken pumpkin risotto?